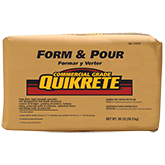 QUIKRETE® Form & Pour Concrete Mix MS (1120-80 / NR810065) is designed to be used as a repair concrete in situations requiring a high quality concrete with a maximum aggregate size of 3/8 in (9.5 mm). An air-entraining admixture is included for superior workability and increased freeze-thaw durability. Microsilica is included for reduced permeability. It includes an integral corrosion inhibitor for cases where maximum corrosion protection is desired. Form & Pour Concrete Mix MS includes densifiers, air entraining and shrinkage compensating admixtures. General or keyway grouting where a maximum aggregate size of 3/8 in is desirable. Leveling beds with a thickness of 2 in (50 mm) or more. Structural repairs where the quantities involved or placement conditions make ready-mixed concrete impractical. Repairs using the form and pour technique on vertical surfaces such as walls and columns.